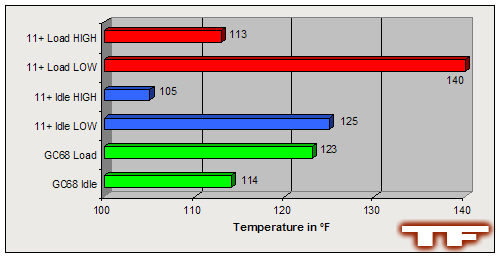 Processor cooling has come a long way in the past few years, computer enthusiasts know that every degree of cooling counts in able to get the most out of their computer. Thermaltake has been a long time manufacturer of processor coolers, most notably, their Volcano series of Heatsinks. While Thermaltake's reputation in the computer enthusiast community is not the best, they still have put out some great products. Today I review the Thermaltake Volcano 11+ Xaser Edition HSF, their latest HSF in their Volcano line of heatsinks. Opening the brown UPS box and shifting through the packaging peanuts, I was surprised to find the Volcano 11+ and its components beautifully displayed in a clear packaging. I was expecting the plain and dull box all the other review sites had been receiving. Apparently Thermaltake has taken notice and changed their old and boring looks. The Volcano 11+ is an all copper HSF with thin copper fins, nothing that we haven't seen before. At the top of the HSF, Thermaltake has a built-on 80mm fan adapter so that you can mount an over-sized 80mm fan onto the 11+. The base's lapping job is nothing to brag about, it isn't terrible, I was simply expecting better. The 11+ uses a screw-driver required three-pronged clip, which secures the HSF very well to the CPU socket. Very standard design for a heatsink. The 11+ comes with a lot of accessories, so many accessories I'd call it overhaul. Included are two fan controllers, one fits into a PCI slot, the other into a 5.25" bay. They allow the manual control of the speed of the Thermaltake Smart-Fan II (which comes already attached to the Volcano 11+). This is handy because at high RPMs, the Smart-Fan II can produce up to 48.5dBA of noise; something that would be more than annoying during the times when your computer is idling. If you don't want to take up a 5.25" bay or reach around to the back of your computer to adjust the fan's speed, use the included Temperature probe that will automatically adjust the fan's speed to the temperature of the CPU. Or don't use any of the above accessories and let the fan run at its highest speed 24/7 by leaving in its jumper. Along with the temperature controlling devices, is the typical thermal paste (that anyone in their right mind would never use), documentation on how to correctly mount and install the Volcano 11+ and small bag of screws. Having two open 5.25" bays on the computer and not having any plans to put anything in those bays, I installed the 5.25" fan controller. The metal used for the 5.25" fan controller was very flimsy, which made its installation a little more challenging than it should have been. Once installed, I connected the jumper from the fan controller to the Volcano 11+ and turned on the computer. During the boot-up, I was playing with the temperature controller's knob and noticed that there was a very significant noise difference between the fan's lowest setting (17dBA) and the fan's highest setting (48dBA). Little did I know the noise difference would parallel the 11+'s cooling differences over the same speed intervals. Time for the Volcano 11+ to meet the competition: the SVC GC68 equipped with a 50.2CFM 80mm Sunon Fan. Both were tested in a closed case with the ambient case temp being 85.5�F (29.7�C). The following was installed and in use during the tests. I ran SETI@Home for an hour before taking results of the LOAD temperatures, the IDLE temperatures were taken an hour after start-up with no un-essential programs running. From the results, we can see at top speeds, the Volcano 11+ easily took honors as the better HSF in both Idle and Load situations against the GC68. However, not everyone can bear listening to a 48dBA squealing fan. At the lowest speeds is where the Volcano 11+ declines.. exponentially. 125�F (51.7�C) for cooling on an idle processor at stock speeds is unacceptable, 140�F (60.0�C) at LOAD is too hot for any stock processor. I was very disappointed with the Volcano 11+ at low fan speeds. While the Volcano 11+ comes in a very appealing package and accessories-a-plenty, its noise vs. performance relation is great big to be overlooked. At high fan speeds, the Volcano 11+ is one of the better standard coolers, at low speeds, it couldn't top a $5 HSF. I was originally going to give this product a 3 out of 5, but during the time I was writing this review, the Smart Fan II died twice, after a reboot, everything returned to normal. The first time [it died] I thought it might be a faulty connection between the Temperature Controller and the Fan, so I disconnected the temperature controller from the fan and put in the jumper so the fan would run at its highest speed non-stop. A few days later, the fan died again. I have since then plugged the Temperature Controller back in and have continued using it with no problems. This may be a bad apple of the batch, but I don't take lightly to the most essential part of a cooling device going out for no reason. Both instances where the fan died it was running fine during start-up. Due to the poor performance at low speeds and the unreliable Smart Fan II, the Thermaltake Volcano 11+ gets a disappointing 2 out of 5. For the $25 - $30 price-tag, you can get the highly acclaimed Thermalright SLK-900A for the same price at Jab-Tech.